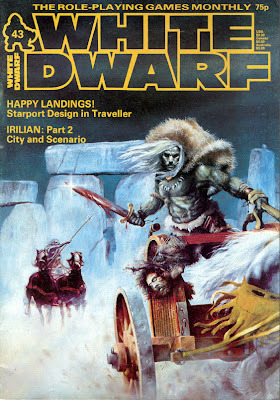 White Dwarf #43 comes to us from the long ago time of July 1983. I was 14 and getting ready to go to High School. White Dwarf gives us this Celtic themed cover. What's inside? 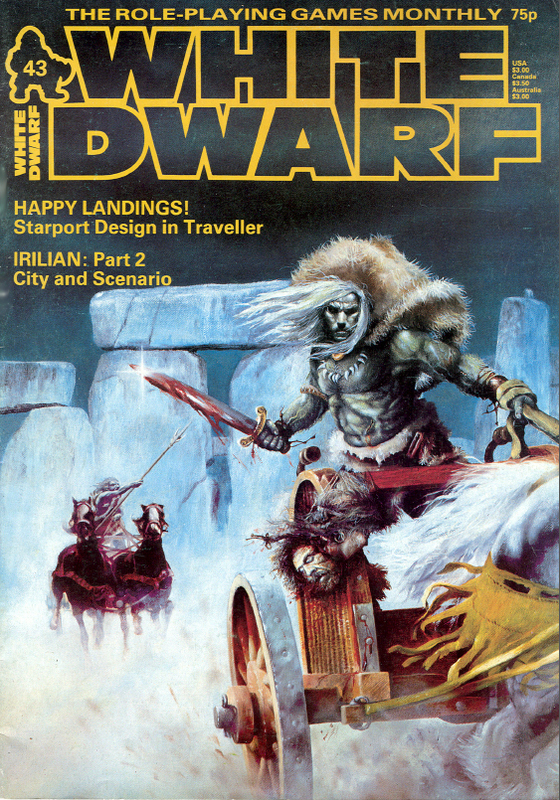 Well we start off with an editorial from Ian Livingstone continuing the same thoughts he had in Issue 41. He notes that some companies have shut down and others are focusing on computer games. Next verse, same as the first I guess. Of course what we didn't know in 1983 was how some of the social aspects of TTRPGs would work their way into computer games, in particular online ones and MMORPG (look, RPG is right there). Still though I think the Ian of 1983 would be happy to converse with the Ian of 2012 and see the changes that have been made, but also how people are still getting around a table to roll dice. Marcus Rowland is up first with three (that's 3!) mini scenarios for last issue's Cthulhu Now. Open Box is up with the game changer game for White Dwarf; Warhammer. At this point in time Warhammer is being produced by Citadel Minatures and only gets an 8/10 from reviewer Joe Denver. Questworld for RuneQuest is next. It gets an overall 6/10 from Oliver Dickinson, who is not impressed. Lastly we have 9/10 review for a Play-by-Mail game, The Tribes of Crane. Kids ask your grandpa about play by mail. A bunch of new sci-fi books as well as some on disproving psychic phenomena (in particular Uri Geller) feature in this month's Critical Mass. Lew Pulsipher is up with buying and selling magic items and why the "magic shop" concept is a ridiculous idea. Oliver Dickinson is back with some Griselda fiction. Andy Slack has vehicle combat for Traveller in this issue's Starbase. The highlight for me is the second part of Irilian. The time the Northwest corner. We get six pages , dozens of locations and NPCs. In the Letters section a letter complaining about having to read about Lew Pulsipher all the time was sent in by Lew Pulsipher. More debate over Don Turnbull and his point of view on the Necromancer class. Thomas Price is up with Starport Design in Traveller. Though there is not much here that couldn't be easily converted over to Star Frontiers, in fact that is exactly what I did. Oliver Dickinson is back, again, in RuneRites, discussing damage absorption in RuneQuest. Fiend Factory has a collection of monsters that appear to be riding something. We get Bug Riders (who ride on bugs), The Lich King (who is riding a Nightmare) and the Vanith-Vadiren, or heavenly elves that ride on pegasi. Treasure Chest covers the martial art Bujutsu for AD&D monks. At the bottom of the page we get another milestone in the publication of White Dwarf. The first strip of the comic Gobbledigook by "Bil" aka Bil Sedgewick. The adventures of Gobbledigook the Goblin will appear off and on till about issue #100. Classifieds and ads end this issue. TSR has a new add featuring all it's Sci-Fi properties; Gamma World, Star Frontiers. Ares magazine and some minigames. Pretty solid issue. I remember when I first got it I was hoping for something more Celtic themed inside, but not this issue. The cover art is cool all the same.